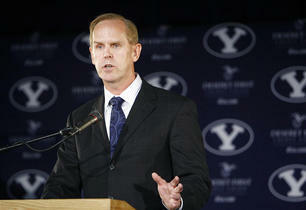 BYU officials finally broke their silence on college expansion issues involving the Big 12 Saturday when athletic director Tom Holmoe called a quick press conference right before kickoff. Holmoe said BYU has every intention to play with the big boys of college football and would do everything possible to keep a high level of competition. Just minutes after he addressed the issue on BYUtv, Holmoe told members of the Utah media BYU had not been offered membership in the Big 12 and, thus, did not turn down an offer but did aspire to play at "the highest levels" of college football.